Ways to Keep Your Hair Soft and Shiny This Winter. 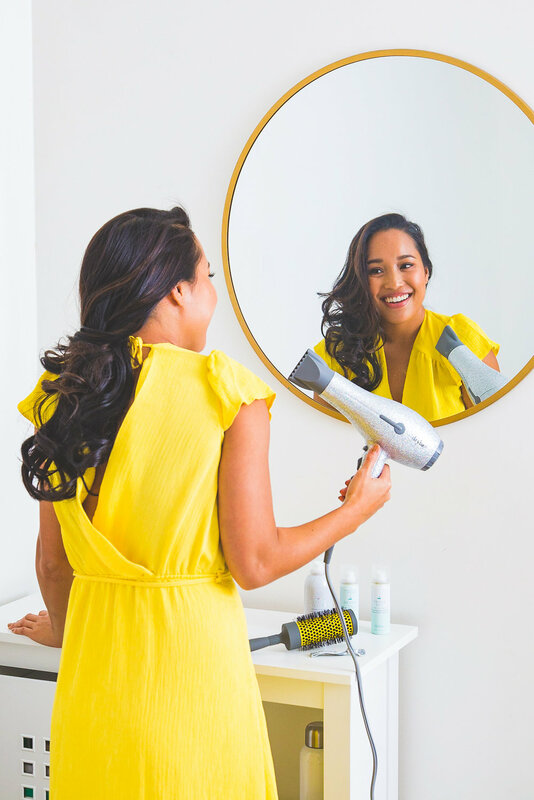 From family get togethers and holiday parties to ringing in the new year and ice skating around Bryant Park, there are tons of events you want your hair to be on-point for this winter! It seems like every time the weather takes a turn for the cold, my hair instantly suffers and loses its glow though. Thankfully, I’ve cracked the code for keeping hair looking great even through the cold winter months. These foolproof tips will help keep your hair soft and shiny all winter long! 1. Don’t wash it every day. This, in addition to those chilly winter winds can quickly dry your hair out. That’s why I always recommend reaching for for dry shampoo in between washes! If it’s really hard for you (it definitely was for me at first! ), start by trying to go every other day without washing it. DryBar has an awesome collection of products like their dry shampoo that I’m always reaching for. More affordable drugstore brands like Garnier also have a killer dry shampoo that does the job well, too! 2. Use a deep conditioning mask once a week. You can find a great deep conditioning treatment at almost any beauty or drugstore! They don’t have to be expensive to give your hair some extra moisture and nourishment. Plus who doesn’t love a little spa night at home? If you really want to treat yourself, stop by the salon (I would definitely recommend Addam of Art & Autonomy if you’re in NYC) for a professional treatment. I try to do this once every season at the very least for healthier hair. 3. Stay away from sulfates by using an all-natural shampoo. Some of the chemicals in your shampoo could be stealing the bounce from your silky locks! Investing in a shampoo that’s good for your hair is a sure-fire way to bring it back to life this winter. If you’re really unsure where to look for one, my recommendation is to ask your hairdresser the next time you’re in for a trim! He or she will know your hair type and will be able to suggest something that would work well for you. Most beauty stores sell these types of shampoos too if you’re on a budget. Don’t be afraid to ask around! An important step towards healthy hair is first, a healthy body. Eat your fruits and veggies! One of the first things that suffers when you’re malnourished is your hair. Especially during the holidays, when eating well-balanced meals isn’t always front of mind! Some foods, like avocado and salmon, contain nutrients that help to promote healthy hair. Sushi date, anyone? Treat yourself to a new silk pillowcase to help decrease split ends and keep your hair from getting frizzy overnight. The silk also allows your hair to retain its moisture while you sleep, instead of soaking it up like a traditional cotton pillowcase. These are also good for your skin too, so win-win! Even if you can only commit to one or two of these tips, every little bit helps! Just a little effort will make all the difference. Do you have any “can’t live without” hair tips I should know about? Leave them in the comments! 7 Ways to Give Back This Season.